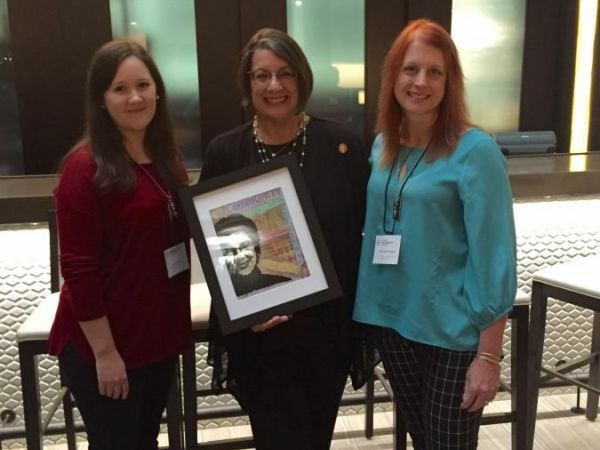 COLUMBUS— State Rep. Nickie J. Antonio (D-Lakewood) received the Legislator of the Year Award from the Buckeye Art Therapy Association at their 35th annual Symposium earlier this month. The Lakewood lawmaker was recognized by the group, and presented with a handmade award from the association. Pictured are State Rep. Nickie Antonio (center), BATA First VP Ashley Rogols (left), and BATA Publications Chair and award artist Diane Fleisch Hughes (right).